Anyway, this song was inspired by the idea that we can’t control what people say about us and sometimes our names will get trashed in the court of public opinion. You don’t always have to try to fix their mistaken ideas about you. Haterz gon’ hate, baby. Sometimes you just have to breathe and let them. 11 “Blessed are you when people revile you and persecute you and utter all kinds of evil against you falsely on my account. 12 Rejoice and be glad, for your reward is great in heaven, for in the same way they persecuted the prophets who were before you. Anyhoo, this is something I need to remember and I remember things better when I sing them. Like the ABC’s and the fact that busses have wheels that go ’round and ’round. 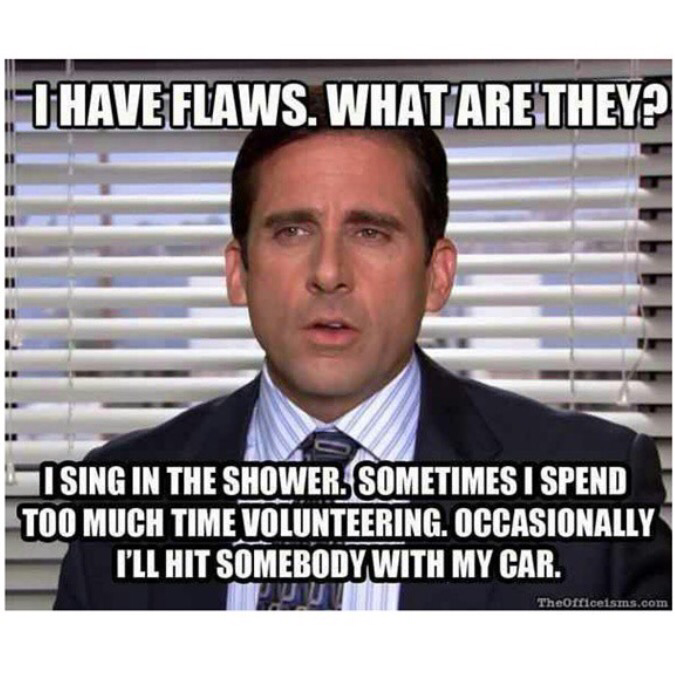 These are my exact flaws. What can I say, I’m only human. Beautiful, charming, intelligent, sophisticated, pure, humble… yes… but human.